Businesses looking for top quality Avaya phones at an economical rate will love the Merlin Magix 4424D+ telephone. It boasts all the features demanded by today’s workforce. Sometimes we get calls from customers that are looking for other brands because they don’t think they can afford Avaya. That’s when I tell them about our refurbished options and my quality guarantee. 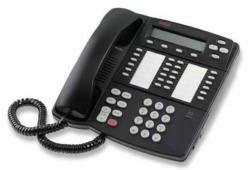 Telcom & Data, a leader in business phone systems, is pleased to offer refurbished Merlin Magix 4424D+ phones. The units have been fully restored and are in “like new” condition. Telcom & Data is now offering the phones at a fraction of the original price. The Merlin 4424D+ delivers all the features required for today’s professionals. The phone boasts 24 programmable buttons as well as hold, transfer, redial, and mute keys. Users are able to participate in conference calls with up to five individuals – two external and three internal parties. A two-way speakerphone and headset interface offers the convenience of hands-free communication. Additionally, the unit has a 2-line by 24-character LCD display that shows an alarm clock and timer, business directory, and caller id. For more information about the Merlin Magix 4424D+ phones, visit Telcom & Data’s website or call 1-800-335-0229. Telcom & Data also carry numerous other Avaya products including IP Office and Partner phones.